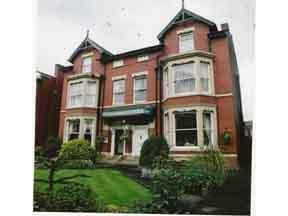 Choose from 25 hotels and guest houses in Greater Manchester. Shown below a just a selection of the hotels available. To search within an area please use the menu on the right. 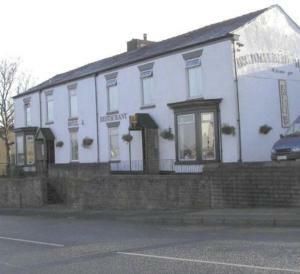 Situated on the fringe of open countryside, this hotel offers breathtaking views of the West Pennine Moors. More than your usual hotel, The Mercure Last Drop Village is a collection of 18th century farmhouses which looks like a village lost in time, with its cobbled streets, craft shops, booksellers, antique shops and local pub. Throw open the window of just about any Last Drop bedroom and you will look out onto a scene of tranquil bliss. Whether the views are over rugged moor land or across the hotels peaceful courtyard, The Last Drop is a place where you will feel totally relaxed. The new Spa Naturel is home to an 18 metre pool, indoor/outdoor hydrotherapy pool and jacuzzi, fully equipped gymnasium, 8 beauty rooms and a relaxation suite. Every one of the 128 en suite bedrooms is beautifully furnished and comes complete with satellite TV, a direct dial telephone, tea/coffee making facilities and a luxury bathroom. If it's a time of celebration, why not make it extra special by choosing one of the four-poster bedrooms. 15 minutes from central Manchester via the nearby Metrolink, 10 minutes from Old Trafford, Cresta Court has free parking, free Wi-Fi and is close to the M60, M56 and M62 motorways. Well placed for Manchester Airport, Best Western Cresta Court is in Altrincham, 4 miles (6.4 km) from Manchester United FC and Lancashire Cricket Club - both 10 minutes by Metrolink. All rooms at Cresta Court have widescreen LCD TVs with Freeview channels. Dettori's restaurant is relaxed, with a continental theme and comfortable lounge-bar. Shops, cafes, bars and the Garrick Theatre are within walking distance. The Lowry, MICC (GMEX) and MEN Arena are easy to reach using the Metro. The Best Western Cresta Court Hotel has excellent facilities for conferences and events. 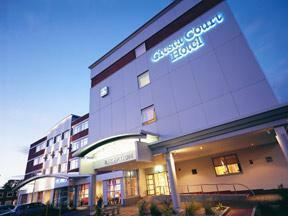 Conveniently located to Sportcity, the hotel is just off the A57 and 4 miles from Manchester City Centre. Ideally placed for visits to Old Trafford, for football and cricket, and the Manchester Evenings News Arena for all the big shows and concerts. As well as this, it is fairly central, enabling those "shopping enthusiasts" to visit the Arndale Centre in the city, and the highly acclaimed Trafford Centre, a few miles out of the city centre. 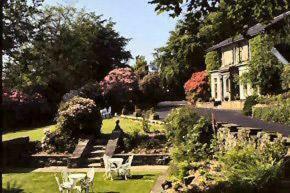 4 star Victorian Hotel set in 10 acres of landscaped gardens. 62 rooms, award winning laureate restaurant, bar, heated swimming pool, sauna, spa gym and meeting/conference rooms. 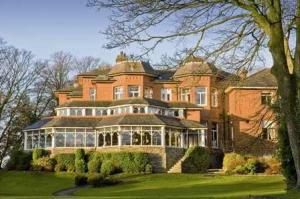 Set in Lancashire countryside with restful views of lakes, well tended gardens and unspoilt woodland, Kilhey Court is an impressive Victorian Hotel offering a high standard of four star accommodation, excellent conference, meeting and banqueting facilities. A former Victorian house, set in ten acres of landscaped gardens fringed by the picturesque Worthington Lakes, the hotel is within easy travelling distance of many tourist attractions, villages and the countryside. Nearby are Wigan Pier, the Albert Dock and Beatles Story in Liverpool, as well as the shopping and nightlife of these two cities. Located 10 minutes (4 km) west of Manchester city centre, Monton House Hotel is a short drive from Old Trafford Football Stadium, the MEN Arena and GMEX. The hotel has comfortable rooms, some of which were refurbished in July 2009. Monton House Hotel has easy access to the motorways, and the nearby Manchester Metrolink stop offers fast, efficient transport to the centre of the city. A regular bus service operates from the hotel into Manchester city centre. Just minutes from Manchester Airport, this hotel offers an airport shuttle service, a modern fitness centre and a location close to Wilmslow, Altrincham and Knutsford. Situated in 18 acres of private grounds, Marriott Manchester Airport is ideal for business and leisure stays close to Manchester Airport and the Cheshire countryside. The state-of-the art fitness centre features a pool and the indulgent Four Seasons Spa. The hotel is also home to a newly designed lounge bar and restaurant, and also offers high-speed Wi-Fi internet access (with fee) and car parking (with fee). On the A573, a mile (1.6 km) from Wigan's city centre, this family-run Victorian hotel is rich in traditional character, with free Wi-Fi, free parking and charming en suite rooms. Family owned and run for over 30 years, the Coaching Inn Hotel takes great pride in offering a warm, friendly welcome and a comfortable, relaxing atmosphere. 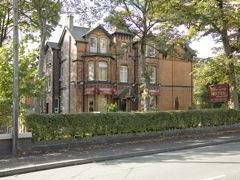 Built in 1895, the hotel offers comfortable, clean en suite rooms with work desks and tea/coffee. There is a small restaurant/bar area, serving home-cooked food in the evenings. 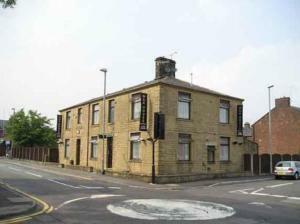 The hotel is on one of the main roads into Wigan and there is a good, regular bus service to and from the city centre. The secure car park has lockable gates and closed-circuit TV cameras operate both inside and outside the property. The hotel is less than 2 miles (3.2 km) from the Three Sisters Racing Circuit and the JJB Stadium (Wigan Athletic FC). Modern, stylish and south of Manchester city centre, Village Manchester Cheadle is a cool and comfortable base for all, with free Wi-Fi, a health-and-fitness club and meeting facilities. 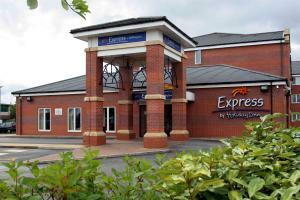 The hotel is a few minutes' drive from Manchester Airport, the M60 and the M56 and has free parking. Places to visit include Joddrell Bank, Tatton Park, The Trafford Centre and Quarry Bank Mill at Styal. Enjoy free access to the Village Health and Fitness with its large swimming pool, gym, aerobics studio and a fitness shop. Children can swim at limited times. For drinks, dining or meeting friends there are the Victory Pub & Kitchen, and Verve Grill. The Hub is ideal for meetings or conferences, and the hotel can host live party nights. Refurbished in 2007, this hotel has great access to the area's major roads, secure car parking, free Wi-Fi access and is within easy reach of the city centre and airport. The modern Best Western Willowbank Hotel is on the outskirts of the city centre, convenient for the universities, the main conference arenas and the city's entertainment and shopping. Manchester city centre is just 5 minutes away and Manchester Airport is only 15 minutes away. The hotel is designed to help you relax, with comfortable rooms. The magnificent Skyway Lounge overlooks the tree-lined Wilmslow Road and has beautiful leather armchairs. A friendly welcome awaits you at our family-run guest house located one mile from the centre of Bolton We provide comfortable beds in well-appointed en suite rooms and a traditional English breakfast. We have free Wi-Fi internet connection. Offering style, comfort and modern facilities for both business and leisure visitors, this hotel is just minutes from the M60. Best Western Hotel Smokies Park is one of the highest rated 3-star properties in Greater Manchester and is just 7 miles from Manchester city centre. The hotel boasts 73 en suite bedrooms, including 10 executive suites, which come complete with king-size beds and luxury extras such as a fresh fruit basket, complimentary newspapers and bathrobes. Standard rooms are also furnished to the highest specifications. 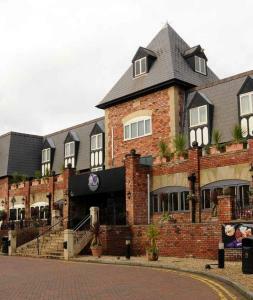 The Brasserie restaurant has a vibrant atmosphere, and offers a wide range of menus to suit all tastes. The Trimnasium is available for complimentary use by all residents and comes complete with sauna, steam room and solarium. Hotel Smokies Park is a super base for visiting local attractions such as The Lowry Art Gallery, Imperial War Museum and of course the world-famous Old Trafford Football Ground. We are a short drive from Saddleworth, home of brass bands and morris dancing, canals and narrow-boats. Please note that the hotel is completely non-smoking. Situated in a peaceful country setting, this family-friendly property enjoys country views and nearby motorway and train connections. Single occupancy is also available. 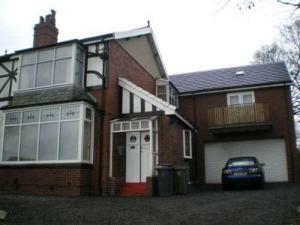 Ingleside House is just 1.5 miles (2.5 km) from junction 5 of the M61 motorway, or 2.5 miles (4 km) from junction 6. Only 3 miles (5 km) from Bolton, the house is on the bus route directly into the town centre and well-connected to Westhoughton and Wigan. Lostock Train Station, with access to the Reebok Stadium, Preston and Manchester, is also just a 6-minute walk away. For a more relaxing break, why not take the short journey (3 miles / 5 km) to the Pennine Moors and Rivington, where you can enjoy a stroll through the beautiful countryside. This hotel with an 18-hole championship golf course, a luxurious day spa and spacious guest rooms is located close to the Trafford Centre and the motorway network. The Marriott Worsley Park Hotel & Country Club offers a fitness centre and a choice of 2 restaurants and 2 bars. 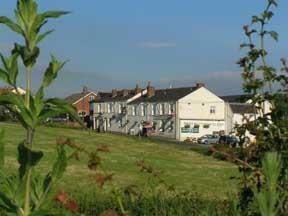 High speed internet access and ample free car parking are available. This Novotel has a swimming pool, superb family facilities and free parking, a short drive from Manchester, Old Trafford, the Trafford Centre and Salford Quays; 12 miles from Manchester Airport. 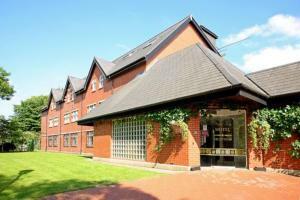 Novotel Manchester West is in the historic village of Worsley. The spacious en suite bedrooms each have a queen-size bed, double sofa bed, work area and a TV with a library of movies and music. You can also listen to your own MP3 player. The Elements restaurant is open from 06:00 until 22:00 and also offers room service. This Novotel has a terrace and gardens with an outside heated swimming pool and a children's play area. Up to 2 children (under 16 years) can stay free (with breakfast) when sharing a room with adults. There is a healthy children's menu and children under 13 get 50% off the main menu. Families also get late check-out on Sundays (until 17:00). Recently refurbished and providing a warm and friendly atmosphere, this modern hotel is approximately 2 miles from Manchester city centre. The hotel is conveniently situated for Old Trafford, the City of Manchester Stadium and the MEN Arena. The Metrolink tram station is a short walk from the hotel, and there is also a bus stop across the road. In addition, the hotel is easily accessible from the motorway network. With wonderful views of the Lancashire countryside, but just 5 minutes from the M6 and M61 motorways, this traditional inn offers free Wi-Fi, delicious food and an impressive selection of real ales. Situated between Chorley and Wigan, the Crown At Worthington has a beautiful, peaceful location, within easy reach of the region's major road network. The well-appointed and comfortable en suite rooms are beautifully decorated and furnished with TVs and tea/coffee making facilities. Fresh fruit, power showers and feather pillows are available on request. The inn has won several awards from CAMRA (the Campaign for Real Ale) and the well-stocked traditional bar offers 8 regularly changing cask ales. Meals are freshly prepared using locally sourced ingredients, with the Butcher's Block steak counter allowing diners to choose their ideal cut. Breakfast is served in the sunny conservatory. The Crown is family run and your hosts, Daniel and Tracy Prince, pride themselves on offering a warm welcome and a relaxing, homely atmosphere. With 2 quality restaurants, free on-site parking and free access to a local Fitness First gym, the warmest welcome awaits you at this hotel, where staff are friendly, courteous and efficient. The team at The Royal Toby Hotel aim to make your stay carefree and memorable. The 24-hour reception offers a wide range of services, including a same-day laundry service. Standard rooms offer style and luxury; executive rooms feature professional modern design; while the lavish four-poster room makes for a beautiful bridal suite. The Royal Toby Hotel has a traditional English restaurant and bar, as well as an Italian restaurant with art and relics to create a 14th-century style. Nestled amid beautifully landscaped gardens in the Cheshire village of Lymm, this Georgian manor house boasts an idyllic setting surrounded by country fields, yet with excellent road network links. Five miles from Warrington and 18 miles from Manchester, the privately-owned Statham Lodge Hotel is also just 12 miles from Manchester Airport and 25 miles from Liverpool, European Capital of Culture 2008. Statham Lodge provides the perfect setting for a range of events, from weddings and civil ceremonies to conferences for up to 250 people. Free parking is also available on-site for 150 cars.